When it comes to garden furniture, the choices are definitely endless. From wooden tables to metal chairs that bring a Parisian feel to your backyard, to comfortable couches for those long summer nights spent outside. If you are a person who likes to coordinate colors, then you might find yourself going for a specific theme in your garden. Why not have that theme be aqua garden furniture? Aqua is a gorgeous color that will liven up your garden in no time, making it the center of attention every time you have people around. If that sounds interesting to you, here are 5 beautiful aqua garden furniture items that you might like. If you have plenty of space in your garden, and you’d like to create a comfortable place to spend time in, we suggest you try an entire wicker patio furniture set in the color aqua. You can snag it on sale for $794.51. It includes a spacious couch, an armchair, and a table to complete the entire look. Especially if you have a pool in your backyard, this ensemble will go perfectly with it. Few things feel better than having breakfast or dinner outside in the garden. Especially when the weather is really nice and sunny. If you are a person who likes to be outside as much as possible, and who enjoys elegant pieces of furniture, you will love this glass patio dining set. You can find it at Walmart for $399.00. The table is made of glass, and you have the possibility of fitting an umbrella in it. That way, you will protect yourself from the sun’s scorching heat. 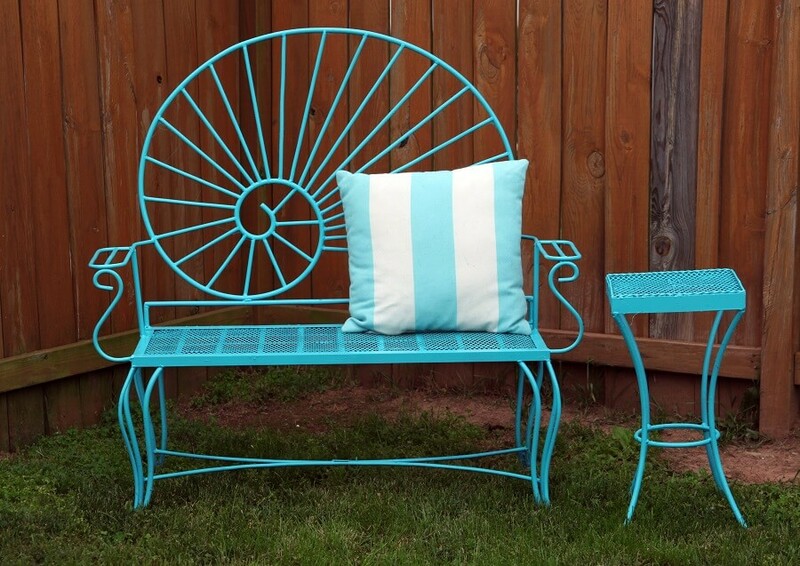 Plus, the chairs are extra comfortable, and they come with gorgeous aqua pillows to liven up your garden. 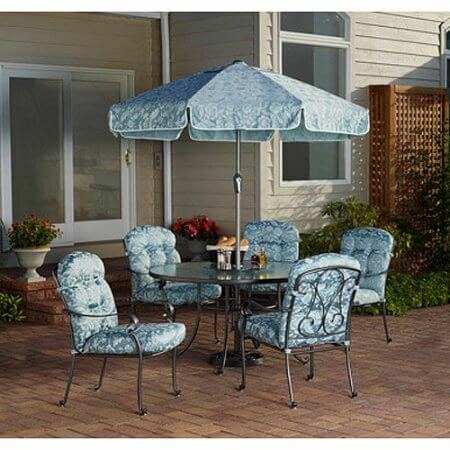 Another truly gorgeous dining set from Walmart ($449.00), this one comes with an assorted umbrella and seat cushions, all in aqua blue. The chairs are perfect not only for dining but for enjoying lazy afternoons outside as well. Trust us, they are extremely comfortable. You can notice an extra touch of elegance in the flowery pattern of the cushions and umbrella. 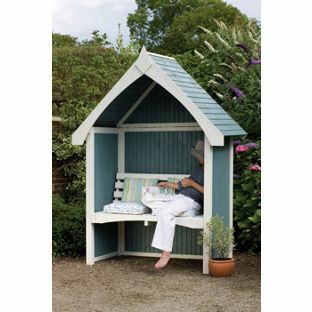 A really functional and beautiful piece of furniture, you can find this aqua limoge arbour at Argos for £499.99. It is perfectly enclosed and it also comes with a roof. So you can be sure that it will protect you from both sun and rain. It has a wooden couch, where you can add pillows and whatever makes you feel comfortable. Then, just curl up there with a good book. 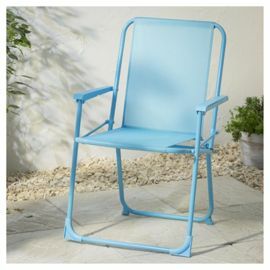 If you don’t have that much space in your garden, but you would also like some aqua garden furniture to brighten up the space, you can also go for a folding picnic chair. You can leave it out, or store it inside and only use it when needed. It is perfect for weekends when you want to eat outside with your family. You can find it available at Tesco. We hope these aqua garden furniture ideas have inspired you to make a change in your garden and go for a more colorful look. 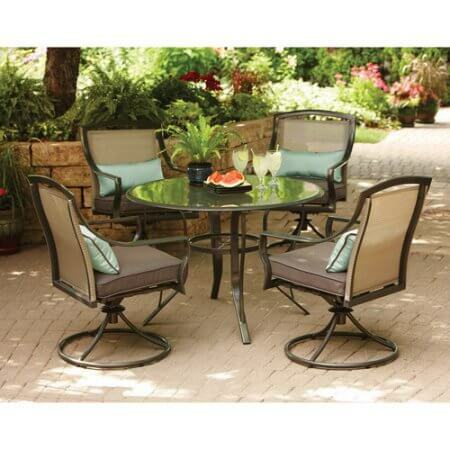 If you want to make your garden the center of attention, some pieces of aqua furniture will definitely do the trick.